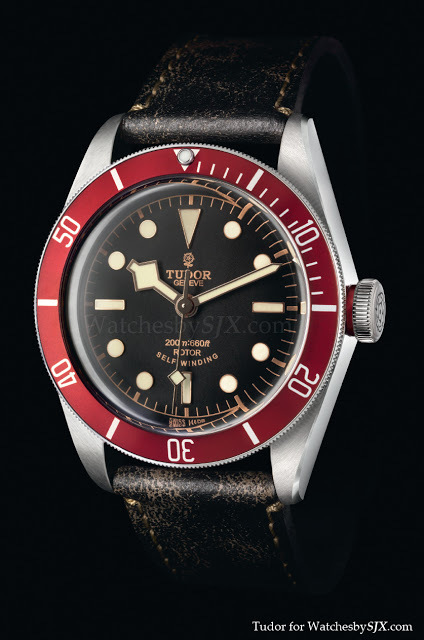 Tudor is continuing its highly successful run of vintage inspired Heritage models with the Black Bay diver (ref. 79220R), just presented at Baselworld 2012. 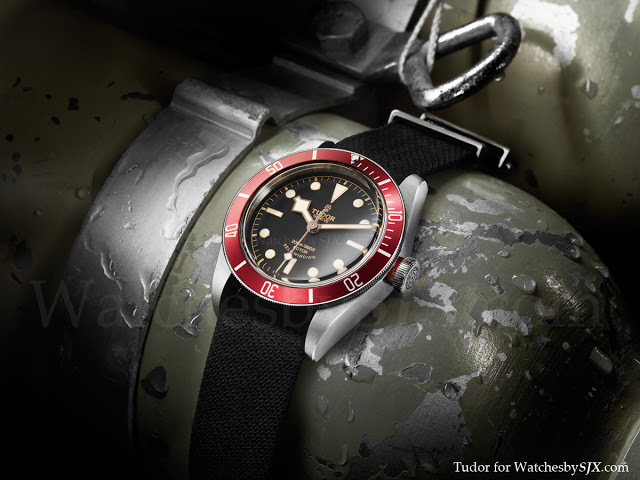 Inspired by various vintage Tudor dive watches, including the famous “snowflake” Submariner, the Black Bay has several features taken from the vintage Tudor divers. It has a domed sapphire crystal and domed dial. Furthermore the dial is a “gilt” dial, with pink gold lettering, indices and hands which makes me think of the early Rolex Submariners. 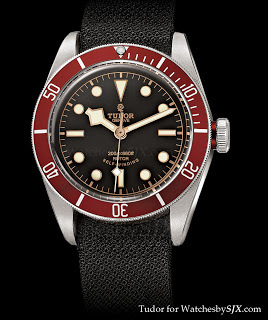 The aluminium bezel insert is matte burgundy, like that on the 1970s Tudor diver. There is also a burgundy ring on the base of the crown, which is topped with the Tudor rose logo. And importantly it has snowflake hands, one of the most distinctive traits of the vintage Tudor Submariners. Admittedly the vintage snowflake watches had square indices on the dial, but I still reckon this looks exceptionally good. It is available with a fabric strap (similar to a NATO strap but with spring bars) and steel bracelet, or a fabric strap and an aged leather strap. The price will be a reasonable USD3700 or so. Traditionalists will see this as a mish-mash of vintage design elements but I don’t mind and I like it. This is a great looking product and I already want one. I have the Heritage Chronograph aka Monte Carlo, and was also impressed by the Heritage Advisor Alarm of 2011. 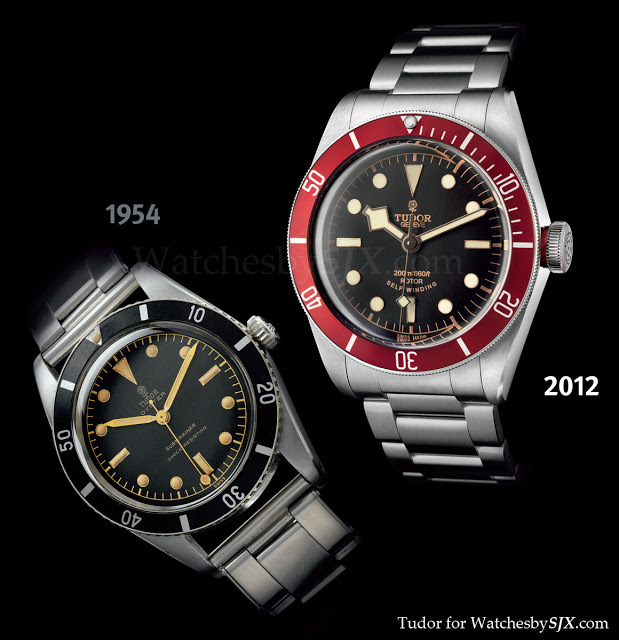 Tudor is on a winning streak. 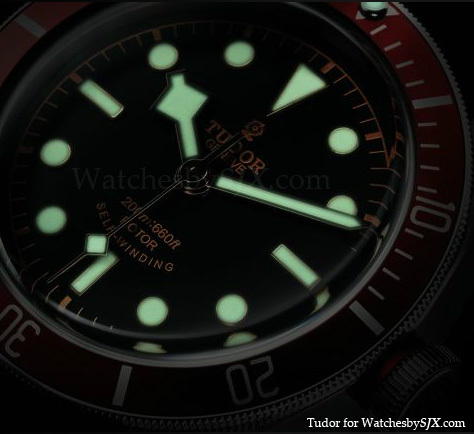 – SJX Update: A few live pics of the Black Bay from Baselworld.